Eat Right with Color is this year’s theme for National Nutrition Month® in March, making this month the perfect time to find your pot of gold at the end of the health rainbow by eating a variety of colors of fruits and vegetables. Each color of produce provides a different mix of nutrients and helps support health in different ways. 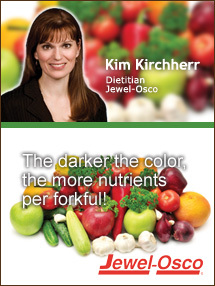 A simple tip for kids and adults alike is that the darker the color, the more nutrients per forkful! But if you like the least colorful choices—like white potatoes—just add some color! Baked potatoes are a nutrient powerhouse on their own but increase the nutrients by mixing in other choices: top the potato with broccoli (and low-fat cheese) or salsa and black beans. Yum! Since it’s March, let’s talk about green fruits and veggies! Eating green produce as part of a balanced diet can help with a variety of health needs, including vision and heart. ◦Green with Envy Smoothie. Blend non-fat or reduced-fat Greek yogurt with your choice of green fruit (e.g. honeydew, kiwi, pear, lime). ◦Green & Lean Salad. Start with any of your favorite greens and add avocado (a heart-smart fat). Then “green it up” with snow peas, broccoli, green beans, peas, asparagus, or cucumber. Add fresh cilantro, flat leaf parsley or mint, and toss in grapes and walnuts or almonds. Top off with vinegar, a splash of olive oil and some lemon zest. ◦Green On-The-Go! Really, any color of fruit or veggie works fantastic as a snack. Wash and slice anything you love and place into a reusable container or baggie and enjoy throughout the day. If refrigeration is an issue, check out some of the new containers with an icepack built right in to the dish! ◦Steamin’ the Greens. Steaming your veggies is super fast, super tasty, and adds vibrant color and crunch to any meal. Use a microwave (check out the new microwaveable freezer bags) or stove top to steam broccoli then top with shredded reduced–fat cheese. It’s kid-friendly and provides two food groups in one simple dish! ◦Greens the Kids will Love. Place salad greens on individual plates and top with assorted vegetables. Arrange slices of reduced-fat cheese, lean luncheon meats, and toasted whole grain bread on a platter. Provide a bowl full of small animal- and plant-shaped cookie cutters. Let the kids choose the slices of meat, cheese and bread to cut into fun shapes, then use them to top off the salad. Serve with salsa or make your own dressing with olive or canola oil and a fun vinegar, like apple cider or raspberry vinegar. March is also National Frozen Food Month, the perfect time to enjoy fruit and vegetable servings from the freezer. But really, since all forms of fruits & veggies count toward your daily recommendation, choose fresh, frozen, canned*, dried or 100% juice … it all matters! Just challenge your family to find new favorites!